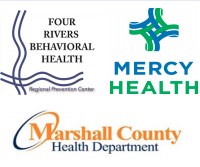 On behalf of Four Rivers Behavioral Health and Marshall County Health Department, we would like to invite you to a full day training on Youth Mental Health First Aid. This will teach you how to identify, understand and respond to signs of mental illnesses and substance use disorders. This 8-hour training gives adults who work with youth the skills they need to reach out and provide initial support to adolescents (ages 12-18) who may be developing a mental health or substance use problem and connect them to the appropriate care. It’s encouraged that teachers, school staff, coaches, camp counselors, youth group leaders, parents, and people who work with youth to join us. To register for Youth Mental Health First Aid on February 26th, follow the embedded link within the PDF or the link below. You will have to create a profile and complete a few steps to register but it shouldn’t take you more than 5 minutes. You will use this log-in/account to complete your evaluation to receive your certificate after you have completed the course. This 8-hour course is FREE and lunch will be provided by Mercy Health. Class size is limited to 30 participants so if you register and cannot attend, please e-mail Samantha Powell at spowell@4rbh.org to have your name taken off of the list to allow someone else to sign up.